Posted February 6, 2019 by Mitch Hitch & filed under City Hub, Featured City Hub. The epic saga over Woollahra Council’s proposed skateboard structure in Rushcutters Bay Park continues. The Council’s original decision to refuse it at a full council meeting in 2017 – 14 votes to 1 – was applauded. But after the September 2018 local council elections, council changed its political complexion. This $1.2 million, 1,252 square metre, seven ramp, Olympic swimming pool-sized structure for 8-14 years olds will be a wart on the face of this iconic park. Council redecided the issue on 15 October 2018 as a fresh idea but it was almost identical to the previous proposal and in the same park as before. Former councillors who’d voted against it were unimpressed. Park users and youngsters were unimpressed. The October 2018 meeting comprised only eight out of 15 councillors. The other seven were magically absent. Council approved their own design but without referring to the Planning Act, the park’s Plan of Management or any limits on the number of users, any age compliance regime, no geo-tech report to test proposed foundations in this former swamp, no safety design audit, heritage impact statement or fauna study to protect the Sulphur-crested cockatoo, or any DA. Did council overstep its authority? A 2,000-strong petition was in the making. Locals, many of whom are young, said, “it’s about location, location, location”. Their analysis shows the viability of eight better spots, all rejected by council. Councillors remain recalcitrant, even rude, snarling back in their emails with, “No-one, and I do mean no-one, frequents this barren corner of the park,” and “Enough is enough… you need to move on,” or “Council’s decision … will not be subject to review … correspondence … will not be entered into,” or, “you have nothing else in your life but to waste it on emails,” all a two-fingered salute to their community. Mayor Cavanagh says, “staff are preparing the necessary application [to the Heritage Office] in compliance with requirements … councillors will be involved with the application” because, in a dramatic twist, the NSW Office of Environment and Heritage has issued an Interim Heritage Order (IHO) on the site to protect it. So it seems works can proceed if, and it’s a big IF, the Heritage Office approves it. Council is preparing its case. Locals are not taking a breather either; they intend to have the park permanently heritage-listed. With a state election set for Saturday 23 March 2019, this Heritage Office decision cleans Premier Gladys Berejeklian’s desk of local problems. And with a federal election looming on Saturday 11 or 18 May, the Member for Wentworth, Kerryn Phelps AM, tweeted: “This is a good decision. Green space is essential to community well-being in dense urban areas”. Her counterpart, David Sharma, formerly of Elizabeth Bay, now in Paddington, posing in a photo with his family in Rushcutters Bay Park, says, “We need to ensure we protect and preserve our … our open spaces, parklands and heritage”. 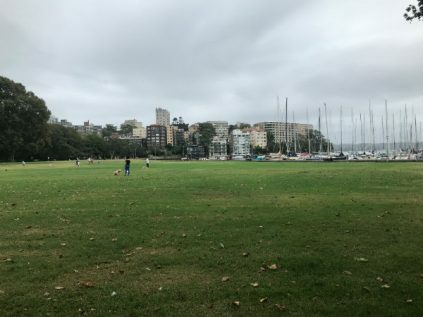 Ms Dixie Coulton, lawyer, former City of Sydney Councillor, local resident for over 20 years, said, “there shouldn’t be a structure like this … [it’s] totally inconsistent with … the park as it is. It should go elsewhere”. Council’s technical services director, Tom O’Hanlon, told ABC radio, “We’ve had hundreds of submissions in favour asking when it’s going to happen”. The answer is: it can happen any time, Tom, but not in this spot. You’ve got eight better options. ABS data 2011-2016 show there are about 220 children between 8 and 14 years old living in the whole Woollahra municipality out of 52,158 people, hardly a majority. The skateboard structure would devour 40% of the last remaining free open space on Woollahra’s side, now enjoyed by children who are picnickers, dog walkers, swimmers, kayakers, tennis players, cricketers, soccer players, yachties, joggers etc. Is it time for Mr Cavanagh to hang up the gold chain and burgundy mayoral robes?